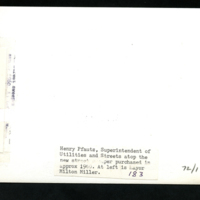 "During Mayor Vogt's term, Roy M. Smith, superintendent of utilities retired and Henry "Hank" Pfautz took that position. He proved to be a wise choice. During the war, Pfautz learned the electrical trade and later established his own business in Hesston. He took pride in his job and diligently applied himself suggesting changes suited to the rapidly growing town. It was the city's loss when, on August 26, 1962, he died from a heart attack. 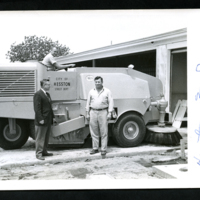 (Bandy, 72)"
unknown, “Street Sweeper, Henry Pfautz and Milton Miller,” Hesston Public Library, accessed April 25, 2019, https://hesston.digitalsckls.info/item/1494.